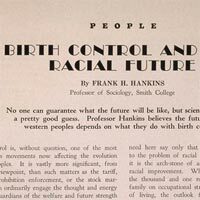 Population control was a key aspect of the eugenics movement. Not only did eugenicists encourage population control (both by sterilization as well as abortion) of classes of people they deemed genetically inferior, but they discouraged its application among the intellectual families that were the most likely to practice it, which was known as positive eugenics. 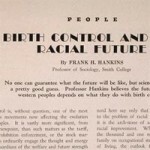 Explore the topic “Birth and Population Control” in the Eugenics Archive to discover some of the arguments made by the eugenicists. Margaret Sanger even makes a guest appearance. Print article This entry was posted by Susan Lauter on March 9, 2010 at 4:53 pm, and is filed under Eugenics Archive. Follow any responses to this post through RSS 2.0. You can skip to the end and leave a response. Pinging is currently not allowed.